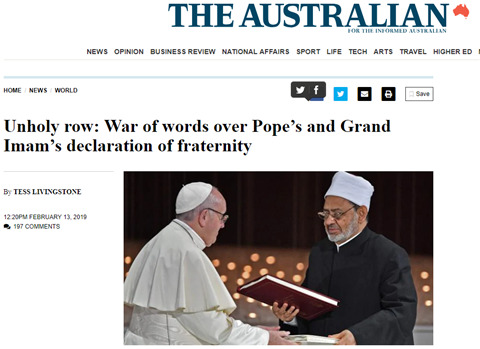 A heated “Chrislam’’ battle is unfolding in the Catholic Church over Pope Francis’s joint document with Islamic leader Sheik Ahmad el-Tayeb, grand imam of Egypt’s al-Azhar mosque, which says the “pluralism and the diversity of religions” are “willed by God in His wisdom”. In a heated war of words, German Cardinals Gerhard Mueller Cardinal Walter Kasper have hurled accusations about “promoting schism’’ and an “anti-Christ’’ influence in current church debates. On Sunday, Cardinal Mueller, sacked by Francis as the Church’s doctrinal chief in 2017, released a “manifesto of faith’’ in seven languages, arguing the joint Christian-Islam declaration contravened Catholic teaching. In his manifesto, Cardinal Mueller said the Christian belief in three persons in the one God was a “fundamental difference’’ from that of other religions. “Therefore, the first letter of John refers to one who denies His divinity as an antichrist,’’ he wrote. Cardinal Kasper, a strong Francis supporter, counterpunched on Monday, accusing Cardinal Mueller of “promoting confusion and schism’’. He said he was “totally appalled’’ by his fellow cardinal’s antichrist reference. Several bishops in the US and Switzerland have publicly supported Cardinal Mueller’s manifesto. In a separate commentary on the Christian-Islam declaration, Bishop Athanasius Schneider of Astana, Kazakhstan said Christianity was “the only God-willed religion … therefore it can never be placed complementarily side-by-side with other religions’’. Doing so would “violate the truth of Divine Revelation’’. The theological wars have taken another new dimension with US Cardinal Raymond Burke, formerly the Vatican’s senior legal officer and also sacked by Francis, launching his own website, cardinalburke.com. Cardinal Burke said it would be “a means of carrying out more fully my mission … especially the teaching of the Church’s doctrine and discipline’’.